Like many other mid-rise multifamily projects, Bayside Anchor in Portland, Maine, is built of wood. The practice has been banned in Sandy Springs, Georgia, which will require larger buildings be made from noncombustible materials. For some builders and architects, wood is the building material of the future, with lower costs and less embodied energy than concrete and steel and suitable even for structures many stories tall. But in Sandy Springs, Georgia, a city of about 100,000 north of Atlanta, wood has been deemed unsuitable for anything taller than three stories and larger than 100,000 square feet. In a unanimous vote on August 16, the Sandy Springs City Council approved changes in the city’s building code that will prohibit the use of structural wood in multifamily projects of that size and up, even as designers elsewhere around the world embrace an expanded use of wood, particularly cross-laminated timber, for multistory construction. Tolbert didn’t name any of those cities and did not respond to a message asking for more information. Likewise, the city’s director of communications and its community development director didn’t respond to requests for comment. The city posted and Tolbert’s memo at its website, but there are no minutes detailing the City Council’s discussion. The ordinance in Sandy Springs seems jarring given the widespread use of wood in multifamily buildings. Conventional stick-building is common — accounting for 87% of multifamily buildings in 2013, according to the website Construction Dive. 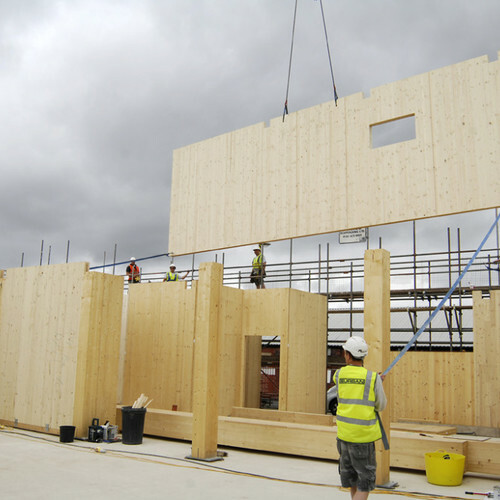 A number of building designers are growing enthusiastic about the potential for cross-laminated timber (CLT), a kind of heavy duty structural plywood, for constructing multistory buildings. 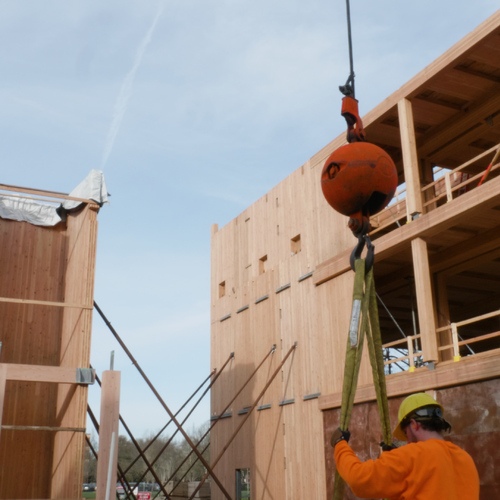 A Portland, Oregon, architectural firm, for example, is planning an eight-story condo building called Carbon12 that would be built with CLT components. In Vancouver, Canada, an 18-story hybrid student residence combining concrete and timber is underway. The $51.5 million project should be finished next year. A 1,000-foot tall high-rise made from timber has been proposed in London. A single company in the U.S. — D.R. 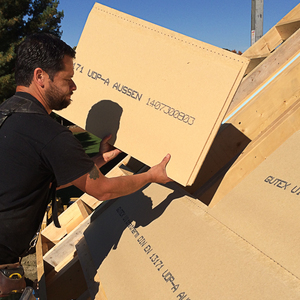 Johnson in southern Oregon — currently makes CTL components, although they have a longer track record in Europe. 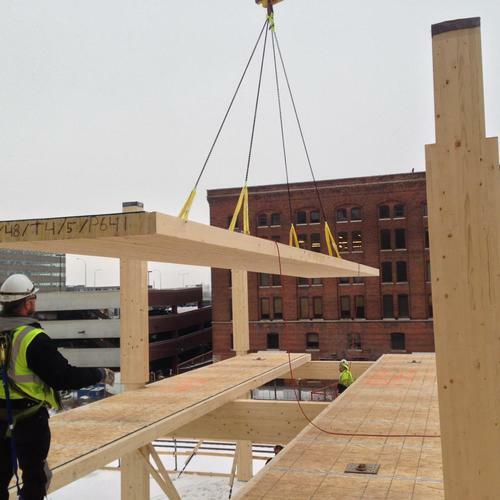 Still, proponents point to a number of advantages timber buildings have over concrete and steel structures, including shorter construction schedules, lower cost, and fewer greenhouse gas emissions. “We’re at the beginning of a revolution, I hope, in the way we build, because this is the first new way to build a skyscraper in probably 100 years or more,” a few years ago. 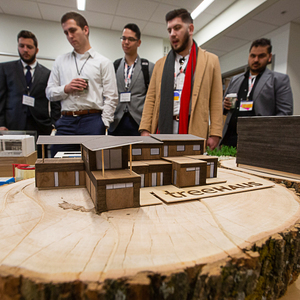 Last year, the U.S. Department of Agriculture in its Tall Wood Building Competition to promote the use of lumber and mass timber building products. It isn’t clear what prompted Sandy Springs to alter its building code. 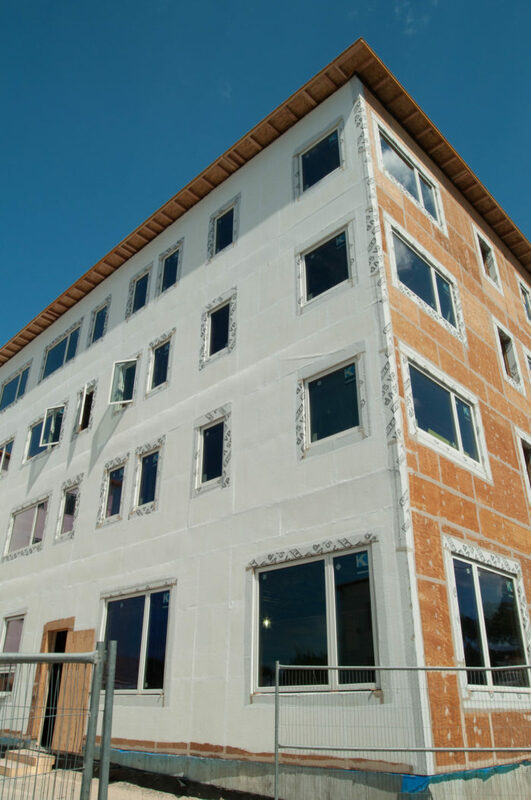 City officials haven’t offered any evidence that wood buildings are any less durable or less safe than concrete and steel structures, and the American Wood Council says evidence does not bear that out. 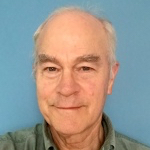 Ken Bland, vice president of codes and regulations for the Council, says that Sandy Springs was given reports from the National Fire Protection Association showing that wood-frame buildings are “equal in performance to street and concrete” in multifamily buildings. A study by the Athena Institute for the city of Minneapolis, he added, showed no evidence that wood-frame buildings were being demolished at a pace any faster than steel and concrete buildings. Asked for a reaction to Tolbert’s claim that “many cities have instituted a requirement for construction with enhanced quality materials,” Bland said, “I would certainly take exception to that statement by the assistant city manager. We honestly do not know of other cities anywhere in the country that have taken a step of this magnitude. There will be certain cities that have fire districts or fire zones, but in terms of a community like Sandy Springs, to my knowledge there’s nothing else like it anywhere else in the U.S.
One probable outcome Bland said, will be a slowdown in the pace of multifamily development. The National Ready Mixed Concrete Association, however, had a much different reaction. , Construction Dive quoted an association spokesman as saying that Sandy Springs was heading in the right direction. Rahim Zadeh, technical director for the Steel Stud Manufacturers Association, said that steel-framed buildings don’t create the fire hazards that wood buildings do, according to Construction Dive. Plus, he said, steel is straighter and more consistent than wood, and is resistant to termites. 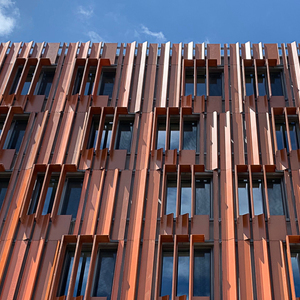 “Steel is more green because of the high recycle content of steel studs,” Zadeh told Construction Dive. The high recycle content in steel studs vs. those studs that literally grow on trees and sequester carbon? It's an odd sort of ordinance to find for any town in a state with a timber industry as large a Georgia's. It is a funny argument to use - especially as neither type of construction would rely on studs for their load-bearing structure. Something else must be in play. This is particularly ironic considering that GA pretty much banned LEED due to timber industry pressure and politics over FSC. Seems to me that if protecting the timber industry interests was that important to the state they would be doing the exact opposite here. The oh-so-green studs with the high recycled content probably comprise less than 20% of the steel used in a steel girder or reinforced concrete structured building. Sounds like they were grasping at straws. Let's hope it's more than lip service with a wink and a nod. But, at the paltry sub-30% thermal efficiency with which the power generators are using that pellet fuel, it's impossible to be truly sustainable, something that needs to be corrected in European regulation. It's one thing to burn pellets in a heat & power cogenerator at 60%+ thermal efficiency, or in a heating-only pellet boiler at 80%+ thermal efficiency, but quite another to just dump it in along with the coal into a sub-critical thermal coal plant and call it "green" or "sustainable". The net emissions vs. carbon sequestration doesn't work out favorably when used at low efficiency- from a climate point of view, within time frames that actually matter, we would literally be better off burning coal in sub-critical coal plants rather than pellets from whole trees, and it's barely break at 50 years if it was only 20% whole-trees, 80% residues. That changes pretty dramatically in a cogeneration scenario, and is at least going to be break-even against #2 oil at 85% efficiency in a heating boiler. Let's see, what has stood the test of time? The Great Pyramids, the Roman Coliseums, the Great Wall of China, the Pantheon, the Barnenez (5000 BC), etc. Masonry, stone, cement, concrete are the tried and true methods that stand the test of time, fire, erosion, nature, etc. I do believe LVL/GluLam beams have their place in high-rises but these are NOT "green" in any true form of the word. Making a LVL requires a lot of energy, synthetic glues, etc. They spin it by claiming a tree is "green" and renewable but it takes SO MUCH energy to take and grow that tree, cut it down, harvest it, press it, glue it with other timber, cure it, and the ship it across the country in semis. What is the embodied energy to do all of that? If not for fire sprinklers, high-rise timber buildings could not exist. Sprinklers are what allows them to be built. I don't know about you but I would rather be on a steel ship vs a wood ship. I would rather be in a concrete and steel high-rise vs a wood frame high-rise building. Wood rots and is combustible and just because it's tree based does not make it the clear "green" choice in high-rise buildings. Sandy Spring is a high-income community on Atlanta's north side. A few years ago, it incorporated and formed the City of Sandy Springs. 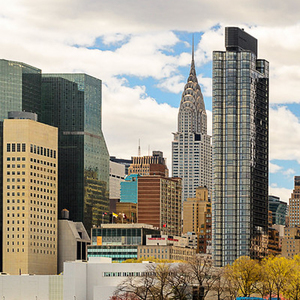 As the economy has recovered, the city has experience phenomenal growth. The new ordinance, which I think is shortsighted, is an attempt to discourage multi-tenant housing by raising the cost of construction. It won't work. Developers will simply opt for taller structures, such as this five-tower mega project being proposed by a Korean company. 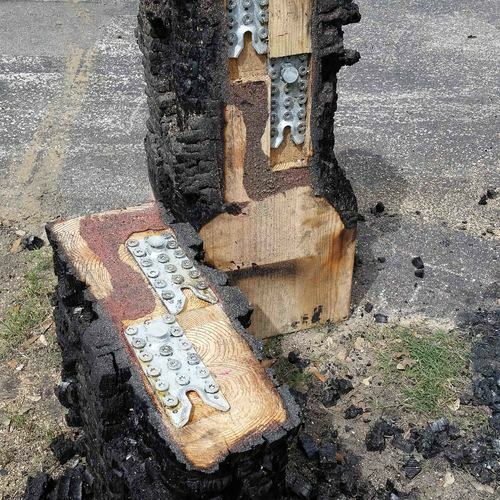 When a timber is exposed to fire, it slowly chars until burned through enough to collapse. A steel girder abruptly turns to spaghetti unless the insulation covering is perfect. Norway's stave churches have nothing on the Chinese & Tibetans though, with numerous examples of millenium plus timber structured temples & monasteries, many in high seisimic activity zones, and many multiple stories tall. Stone versions don't always survive. The vast majority of the energy used for growing trees is site-solar photosynthesis, sequestering atmospheric carbon. But of course there are additional energy inputs, but they're small by comparison to the total solar energy input. US urban multi story structures aren't designed for or intended intended to have 500+ year old lifespans, independent of the structural materials used, though with maintenance many or most could go the distance, again, independent of the structural materials used. "For metallic components such as steel fabrications and aluminium extrusions, the manufacturing penalties in terms of embodied energy are large. In the case of reinforced concrete, the steel reinforcement contributes significantly to the total embodied energy. None of these materials are able to offset their production energy against the sequestered carbon from tree growth. It is also the case with glulam manufacture that the residual wood, shavings and sawdust are converted into energy through power/heat co-generation in the factory itself, substituting for fossil energy. Thus we find that steel or reinforced concrete beams cost five or six times more energy to produce, compared with glulam beams, based on structural sections of equivalent performance. The exact figure for this comparison cannot be generalised, since it depends upon technical aspects such as the selected cross-sectional shapes, the grades of the comparative materials and the loading combinations. However several studies have now been made, taking advantage of the common harmonised safety format of the Eurocodes, which justify this statement." Yes, that is timber association propaganda/spin, but it very far wrong? (Not nearly as much spin as the whole recycled content of steel studs argument, IMHO.) The embodied energy and carbon footprint of concrete is large, but so is steel. It's bizarre that an entire city council would vote overwhelmingly on an esoteric topic like the structural support system of buildings in their community. Aesthetics I could understand, but how many people on a typical city council knows anything about cross laminated lumber? I agree with the comments about discouraging multifamily housing; there's something else going on . . .
Sandy springs already has a lot of 3-4 story stick built multifamily. IMO they'd rather go big and expensive as their tax base isn't all that large. OR they simply have more faith in the commercial trades doing steel/concrete than those doing wood framing. Atlanta is a production builder mecca. Below is a taste of a lovely development approved by the City of Smyrna. Smyrna, like Sandy Springs, is located just outside downtown Atlanta.